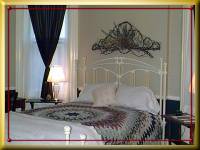 With a Queen size iron bed and country quilt, the Blue Room features views of City Park and the leather tanner's mansion and retains its original inlaid hardwood floors. This room has a shared bath with the Yellow Room. The Rose Room overlooks Penn's Common City Park. 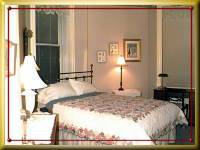 This room with a view has a queen size iron bed and private bath, all with a Victorian touch. 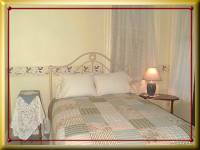 The Yellow Room is warm and sunny with a Queen size iron bed. Enjoy the beautiful view of Neversink Mountain from the adjoining screened porch. This room has a shared bath with the Blue Room. 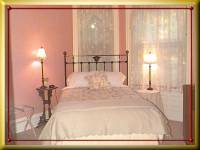 Relax on the Queen size white iron bed with country quilt, surrounded by antiques. This room has a private bath. Originally used to house the Mould's carriage, this cozy cottage has low ceilings, Queen size iron bed, a pull-out couch in the living room, refrigerator, and includes a private bath. 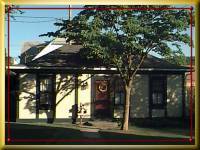 All accommodations include an extended continental breakfast featuring homemade breads and pastries, cable TV, air conditioning, and off-street parking. Payment of one half of the total reservations is required to confirm reservations. Major credit cards - VISA, MasterCard, American Express, and Discover - and cash are accepted. Cancellations must be received ten days prior to arrival. If cancellations occur less than ten days prior, you will incur one night's charge. Arrival time is between 4:00PM and 7:00PM unless other arrangements are made. We're sorry, but our old house can't accommodate pets or smoking. We are pleased to host well-supervised children 12 years of age or older.